The denizens of Ankh-Morpork fancy they've seen just about everything. But then comes the Ankh-Morpork Times, struggling scribe William de Worde's upper-crust newsletter turned Discworld's first paper of record. An ethical journalist, de Worde has a proclivity for investigating stories—a nasty habit that soon creates powerful enemies eager to stop his presses. And what better way than to start the Inquirer, a titillating (well, what else would it be?) tabloid that conveniently interchanges what's real for what sells. 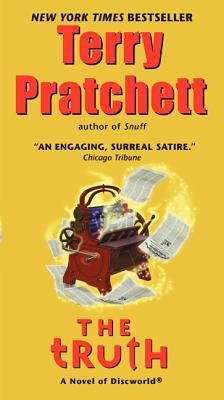 But de Worde's got an inside line on the hot story concerning Ankh-Morpork's leading patrician, Lord Vetinari. The facts say Vetinari is guilty. But as William de Worde learns, facts don't always tell the whole story. There's that pesky little thing called . . . the truth.